Situated on the north shore of Lake Sutherland, this property is a great "home base" for those exploring the North Olympic Peninsula, hiking the Elwah Valley or just looking to enjoy swimming, kayaking and fishing on beautiful Lake Sutherland. Nestled in the Olympic Mountains. This old lake cabin has been recently renovated --updating the kitchen, bathroom and main living area. The upstairs bedroom has a queen-size bed and picture windows presenting a beautiful, wide view of the lake. Wake up in this spacious loft-like bedroom and the serenity of the lake before you. There is a flat screen smart TV in the bedroom, with a DVD player. You can enjoy your favorite movies by logging into your Netflix, Hulu or other online TV account, or by bringing your favorite DVD movies. There are a few DVDs at the cabin for your selection, too. Downstairs on the main floor, there is also a double-size sleeper sofa set up as a permanent bed, with privacy draping, to accommodate guests for sleeping. Easy drive to Ocean Beaches and other points of interest like Salt Creek for low tide pool viewings, Makah Museum is a must see, Cape Flattery most NW point in the continental US, Ozette trail is a wonderful hike starting at Lake Ozette and to the Ocean then back up to Lake Ozette (9 miles). Also two entries to the Olympic National Park are near by, Sol duc Hot Springs and Hoh Rain Forest. Lake Cresent is a beautiful lake with an historic lodge for dining and a fun gift shop. The main floor living space is open-concept. The kitchen is updated with beautiful counters and an built-in electric stove top. There is a toaster oven and microwave, but no other baking oven. There is a drip coffee make and tea kettle for your favorite hot beverages. We provide dishes, pots, pans, cups, glasses, serving dishes and utensils. Please be careful about putting anything on the shelf above the glass topped stove! The lake side of the room is banked by windows so that you always have a view of the lake. There is a large evergreen just to the left of the view. It is a favorite roost of one of the resident eagles at Lake Sutherland. The dining table sits in front of these windows for dining with a view. There is a love seat, adjacent to the dining space, creating a wonderful place relax and enjoy a good book or just stare out onto the lake. Please note that there are caution signs on the deck railing, please no climbing or leaning on railing. The trails to the house and down to the dock at the lake are clear, but steep. Some agility is required. On the dock there are 3 kayaks for guest use. Paddles and life vests are in the boat house. The paddle boat on the right side of the dock is NOT functional. Please don't try to use it. Also the right side of the dock is for boat storage only ---safe, but not super stable for hanging out on. The left side of the dock can be used for hanging out and fishing. The dock sits right in front of a deep fishing hole. Please be advised: All water activities are at your own risk. Wanting a fishing get away? Lake Sutherland is a great place to catch Kokanee (land-locked salmon). No live bait is allowed for fishing on Lake Sutherland, so bring your power bait or "wedding bells", "cowbells" or "spoons". The location! This was absolutely beautiful, I fell in love the second we arrived. While it wasnt the most obvious spot to find and the door alarm was a bit finicky, once you get inside its well worth it. With a modern and thoughtful interior and a view of the lake that is unrivaled, this cabin was everything I hoped for and more. The pictures might look good but just wait until you see it in person. I highly recommend this Airbnb. The view is breathtaking! The weather is nice and cool! The bed is comfortable! 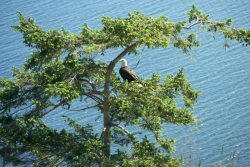 Perfect location between Forks and Port Angeles for hiking! We will definitely stay here again in the future! You can't go wrong with this beauty!